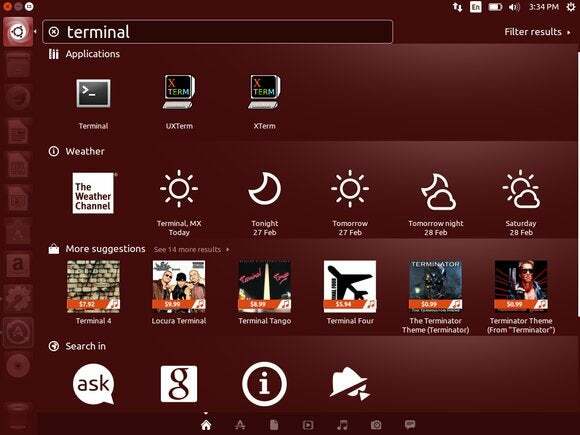 When you install Ubuntu the Unity desktop will send your searches over the web by default, showing you products you can purchase from Amazon and other retailers, including eBay. Oh, you searched for Firefox? Did you mean you wanted to purchase a Mountain Equipment Men’s Firefox Jacket from Amazon? No thanks, Ubuntu—I just wanted to launch Firefox. This is an obnoxious and privacy-concerning feature, and Canonical has been raked over the coals for it by the EFF. They’ll finally be dropping it in the next version of Unity, Unity 8. But Unity 8 needs a lot of work and won’t arrive on desktops until Ubuntu 16.04 in April 2016—Canonical is more focused on Ubuntu for smartphones in the short term. There’s no need to wait. Here’s how to strip the annoying shopping search results out today, be it with a sledgehammer or with a scalpel. There’s a graphical option that lets you disable all online search features, but as the name implies, it removes all the online search results—some of which you might want. 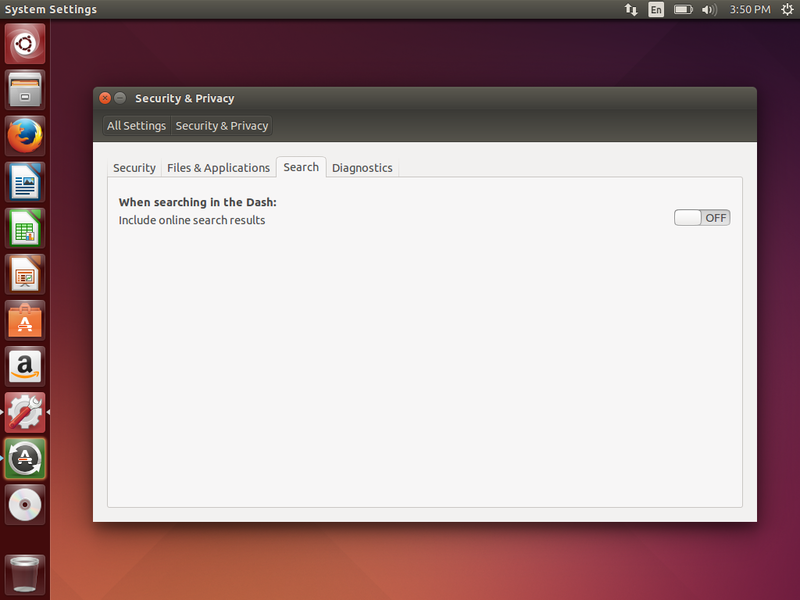 This option is available in Ubuntu’s System Settings window. Click the gear icon at the top-right corner of your screen and select System Settings to open it. Click the Security & Privacy icon, and click over to the Search tab. Under “When searching in the Dash,” set the “Include online search results” slider to “Off.” Easy! If you just want to search your local computer and never see online search results, this option works well. Despite the vague naming, this option also prevents your computer from sending your searches over the Internet. It doesn’t just hide the search results. What if you only want to hide shopping results? Read on. In Ubuntu 14.04, Unity’s Amazon search integration is no longer part of a specific package, so you can’t just uninstall the “shopping lens” package anymore. Instead, use the below command to disable the Amazon plug-in and other shopping plug-ins. You’ll need to do this from a terminal window. Open a Terminal by opening the Dash and performing a search for “Terminal.” Yes, you’ll see advertisements for the movie “The Terminal” on Amazon, but just click the icon that opens the Terminal application on your computer. That’s it! You’re done. You don’t even have to reboot. And, while you’re at it, feel free to right-click the Amazon icon that comes on Unity’s launcher and select Unlock from Launcher. This will remove the icon and free up some space. If you’re not a fan of Unity in general, you can just use another desktop environment. Variations of Ubuntu like Kubuntu, Xubuntu, Lubuntu, and others don’t use the Unity desktop, and they don’t have the shopping search stuff built in. That’s just part of the default Unity desktop, not the Ubuntu project as a whole.